Welcome! If you are following along on the blog hop you should be joining us from Pam Nichols’s blog. I am so excited to be able to join this talented group of ladies today on my first official Team Stamp It blog hop. It’s been so much fun getting to play with all the new products in the Holiday catalog – one of the best parts of becoming a demonstrator! ¡Bienvenido! Si usted está siguiendo a lo largo del blog hop usted debe unirse a nosotros del blog de Pam Nichols blog. Estoy tan emocionado de poder unirme a este talentoso grupo de damas hoy en mi primer Stamp It blog hop. Ha sido muy divertido llegar a jugar con todos los nuevos productos en el catálogo de Navidad-una de las mejores partes de convertirse en un demostradora! Today we are sharing some fun fall projects on everyone’s blogs. 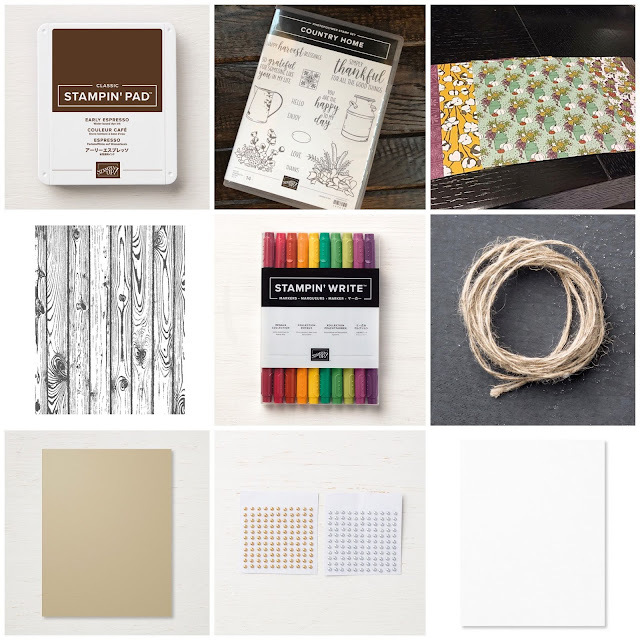 I love the new stamp sets in the Holiday Catalog and the beautiful patterned paper and embellishment and…well you get the picture. I love everything! One of the first suites that jumped out at me was Farmhouse Christmas. Although I live in the city – I love all things vintage and farmhouse (think Magnolia Market and Chip & Joanna Gaines). I love the beautiful patterns in the designer series paper but with my busy schedule I try to find simple cards with big impact. Hoy estamos compartiendo algunos proyectos de otoño divertidos en los blogs de todos. Me encantan los nuevos sellos en el catálogo de Navidad y los papeles estampado y los adornos y... bueno, ya se pueden imaginar. ¡Me encanta todo! Una de las primeras Suites que me saltó fue Farmhouse Christmas. A pesar de que vivo en la ciudad-me encantan todas las cosas vintage y de granja (imagina el estilo de Magnolia Market y Chip y Joanna Gaines). Me encantan los hermosos dibujos en el papel de la DSP pero con mi agenda apretada trato de encontrar tarjetas sencillas con gran impacto. Here I layered the shiplap style paper from the Festive Farmhouse DSP (147820) cut at 4” x 5.25” over a Crumb Cake cardstock base. Then I stamped the Woodgrain background stamp in Early Espresso on Crumb Cake cardstock and cut down to 1.25”. I stamped the sentiment on Whisper White. I cut one of the beautiful enamelware jug and dried flower arrangements from the DSP and popped it up on stampin dimensionals. I then used markers to stamp each color separately - Old Olive, Crushed Curry and Blackberry Bliss are the colors found in this image that I cut. The final touch is creating a bow with long tails to make it look like a hanger and a gold metallic pearl that looks like a nail head. Aquí he estratificado el papel de estilo shiplap de Festive Farmhouse (147820) corte a 4 "x 5,25" sobre una cartulina base. Entonces me selló el sello de fondo viruta en el espresso temprano en el pastel de migas cartulina y reducir a 1,25”. He sellado el sentimiento en susurro blanco. Corté una de las hermosas jarras de enamelware y los arreglos de flores secas de la DSP y apareció en las Stampin Dimensionals. Entonces usé marcadores para estampar cada color por separado-Old Olive, Crushed Curry y Blackberry Bliss son los colores encontrados en esta imagen que corté. El toque final es la creación de un arco con colas largas para que se vea como una percha y una perla metálica de oro que se ve como una cabeza de clavo. Hope you have enjoyed my card today. Please comment below and let me know what you love about fall! There is also a great chance to win some fun goodies! If you like what you see, please check out my Facebook and Instagram accounts for more goodies, or sign up for my newsletter to make sure you see all the new projects I will be sharing in the upcoming weeks and months! Espero que hayan disfrutado de mi tarjeta hoy. Por favor, comentar a continuación y hacerme saber lo que te gusta del otoño! También hay una gran oportunidad de ganar algunas cosas divertidas! Si te gusta lo que ves, por favor echa un correo electrónico a mis cuentas de Facebook y Instagram para obtener más beneficios, o inscribirse en mi boletín para asegurarse de que ver todos los nuevos proyectos que se comparten en las próximas semanas y meses! 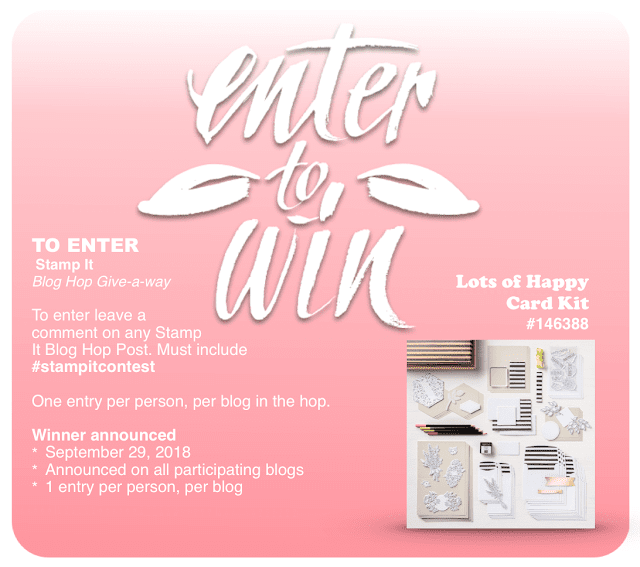 Keep hopping along to see the rest of the great projects from the ladies and if you comment on the blogs on this hop there is great prize available – the next stop is Rach the Stamper. We will pick the winner by Sept 29th, so some come back here when I announce the winner. Seguir saltando a lo largo de ver el resto de los grandes proyectos de las damas y si usted comenta en los blogs en este hop hay gran premio disponible-la próxima parada es Rach the Stamper. Vamos a recoger al ganador antes del 29 de septiembre, así que algunos vuelven aquí cuando anuncio al ganador. Join the hop and see everyone's great Fall projects. Remember to leave a comment on each blog for more chances to win! Sigue el hop para ver todos los proyectos inspirados. Recuerda dejar su comentario en cada blog para tener mas oportunidad de ganar el premio! #stampitcontest love the country fall feel I love the Fall. Thanks for hoping along! We will have another hop with a Halloween/Fall theme on Sept 29th. Please join us again as we announce the winner and share lots of inspiration. I would love if you subscribed to my newsletter and look out for more prizes next week. These cards and winners! Absolutely love them. #stampitcontest I love what you did with the designer paper. Great simple card that doesn’t look simple! A lot of visual interest. Thank you for the great project and for the blog hop! #stampitcontest Like the wood textures. Lovely card. Floral milk can image packs a big punch the way you designed your project. Looks like this came right from Magnolia Farms. A very sweet idea.